Bloc’s Software Engineering Track takes approximately 2,000 hours to complete. Depending on your pace, we distribute those hours across 48 or 72 weeks. That’s a long time, and students often ask if they can complete the track faster. Our answer is unequivocally, “no.” We insist on 2,000 hours because — like mentorship, curriculum, platform, and community — adequate time is essential for learning a new skill. It can not be truncated, even in the spirit of hustle or efficiency. To understand why time is so important, you must first understand how we view the path to mastery. Any craft can be mastered, barring physical limitations. That is to say, I believe that I could become a masterful guitar player; but my dream of playing quarterback for the New York Giants is undoubtedly limited by my age, height, speed, strength, and my body’s inability to absorb blind-side sacks delivered by 250 pound linebackers. But most crafts can be mastered, and the path to mastery has been well-defined for hundreds of years. During the middle ages, an apprenticeship system emerged where young adults lived, worked, and learned from an experienced mentor — a master. An apprentice signed a contract and spent seven years learning a craft like metalwork, medicine, cobbling, or tailoring. After their apprenticeship, the apprentice became a master, established their own business, and mentored apprentices of their own. The apprenticeship system of the middle ages was successful, and still applies to current crafts, like electrical work, which has a standard apprenticeship of four years. The apprenticeship system is successful because of three factors: mentorship, practice, and time. In the middle ages, masters provided the mentorship and the apprenticeship contract ensured that practice and time were accounted for. Let’s discuss each of these factors. A mentor is more than a teacher. Mentors know how to teach, but they are also masters of their craft. A mentor adapts to their apprentice and their apprentice’s learning curve. They understand when to pressure the apprentice, when to help, and when to challenge. A mentor can predict when the apprentice will struggle and adjust their lesson accordingly. Mentors do not give you a shortcut, but they streamline the process. They invariably had their own great mentors, giving them a richer and deeper knowledge of their field. Their ensuing years of experience taught them invaluable lessons and strategies for learning. Their knowledge and experience become yours; they can direct you away from unnecessary side paths or errors.They observe you at work and provide real-time feedback, making your practice time more efficient. Their advice is tailored to your circumstances and your needs. Working Closely with them, you absorb the essence of their creative spirit, which you can now adapt in your own way. What took you ten years on your own could have been done in five with proper direction. When you commit to learning a craft, you accumulate personal debt. “I will become a grandmaster chess player” is a lofty goal that will require an arduous apprenticeship. The only way to pay down a debt is with consistent payments over the course of months or years. In an apprenticeship, your payment is practice. 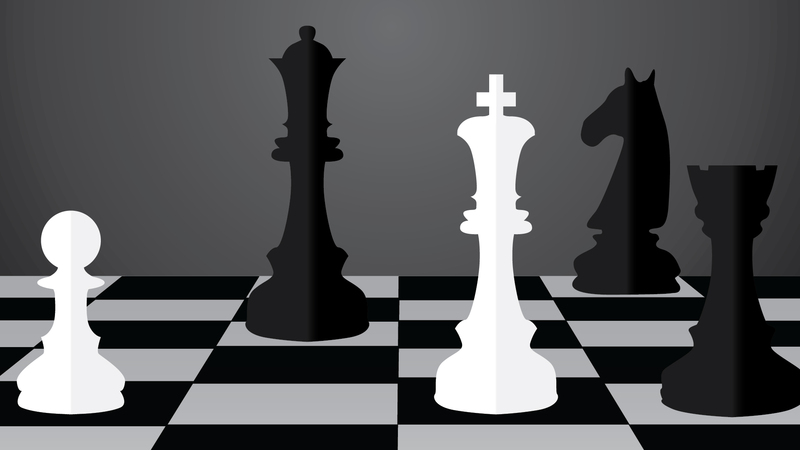 Your payment may be small one day and large the next – 30 minutes of practicing chess tactics or 4 hours of match play – but the key is that you keep paying. Any debt can be paid off, as long as you commit to a regular payment schedule. Consistent practice is absolute with an apprenticeship, without it there is no path to mastery. Managing to get his hands on the keys to the high school gym, he created for himself a schedule–three and a half hours of practice after school and on Sundays, eight hours every Saturday, and three hours a day during the summer. Over the years, he would keep rigidly to this schedule. In the gym, he would put ten-pound weights in his shoes to strengthen his legs and give him more spring to his jump. His greatest weaknesses, he decided, were his dribbling and his overall slowness. He would have to work on these and also transform himself into a superior passer to make up for his lack of speed. 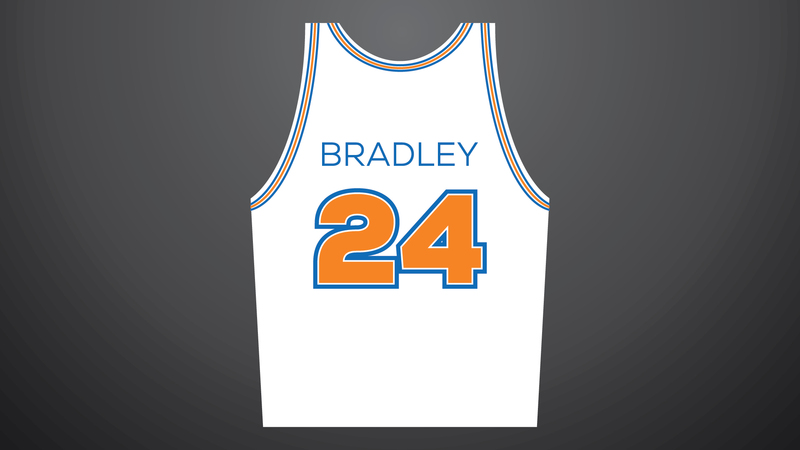 Through disciplined and consistent practice, Bradley became an all-time great professional basketball player. He mastered a craft that’s constrained by physical attributes, which is a remarkable achievement. After he retired from basketball, Bradley applied similar rigor and work ethic to another craft he was not naturally suited for – politics. He served three terms as a U.S. Senator for New Jersey, and a campaigned for the 2000 Democratic presidential nomination. The time it takes to master a craft depends on the person, the craft, and the mentor, though 10,000 hours seems to be a reasonable average for most cognitive crafts. For 99.99% of people, there are no exceptions to this average. Mastery takes time, and there are no shortcuts. The need for cobblers isn’t what it once was, but as software eats the world, the need for software engineers grows. 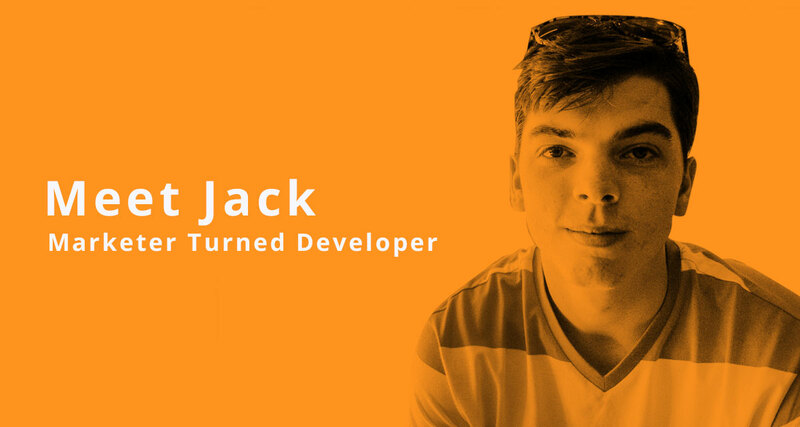 The craft of software engineering lends itself to the apprenticeship system. It is complex and requires skills in reasoning, logic, art, math, and theory. Software’s complexity requires masters to develop it, and teach it. Unfortunately constraints such as time, money, and competition in business impact the ability for masters to train apprentices. Formal software apprenticeships exist – thoughtbot, 8th Light, and Trunk Club offer paid apprenticeships where apprentices train with master software developers – but these apprenticeships are limited. They last only several months, are offered in specific locations, and admit a small number of apprentices. 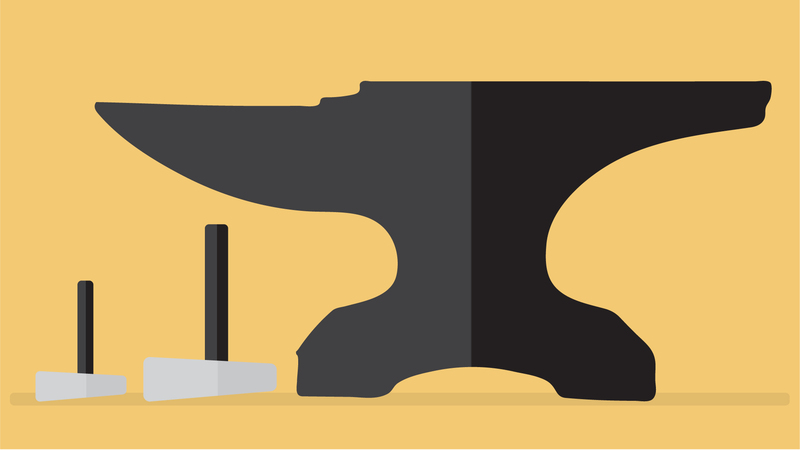 These limitations demonstrate the difficulty with scaling apprenticeship programs. Coding bootcamps attempt to solve the problem of scale by offering online and and classroom-based focused training, but they lack the key factors of mentorship and time. The average coding bootcamp lasts 12 weeks, or approximately 500 hours. 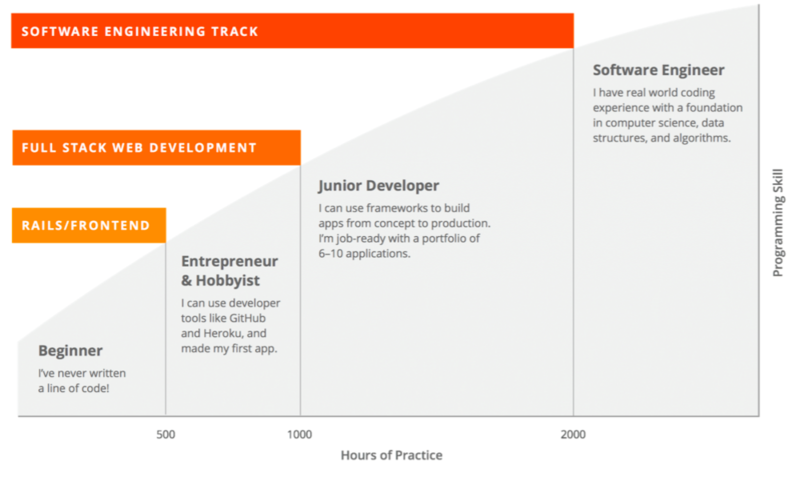 This is the average learning curve for becoming a software professional. The minimum number of hours needed to become a proficient, entry-level full stack web developer is approximately 1,000 hours. After consulting with world-class engineering teams, we learned that there is a skills gap between a full stack web developer and software engineer, which neither coding bootcamps nor universities are addressing. We believe that this skill gap can be closed with an additional 1,000 hours of focused practice, which is why we require a minimum of 2,000 hours for our Software Engineering Track. We support this requirement with a tuition reimbursement policy – if you’re not able to start a career as a software engineer after graduation, we’ll refund your entire tuition. We are able to make such a guarantee because we know that the apprenticeship model is effective, given proper mentorship and 2,000 hours of consistent and focused practice. Our mentors and curriculum teach students and provide realistic practice through building software and contributing to open-source software. Our platform ensures that students develop a consistent and focused practice schedule. Our track is paced for 2,000 hours, which ensures that a student has spent enough time as an apprentice to begin work as a professional software engineer. While it would be interesting to offer a 10,000 hour program for software engineering mastery, we believe that 2,000 hours is an appropriate amount of time to start a new career as a professional software engineer. A graduate of our Software Engineering Track will understand how to learn from a mentor, they will have disciplined habits and practice consistently, and with these skills internalized, they will know that the path to mastery is simply a matter of time. It’s an inspirational idea – to think that you can master a craft with such a simple formula. Seek mentorship, find realistic ways to practice your skills, develop consistency in your schedule, and practice for years. You will become a master.